At Towers Park in South Arlington, 1-2pm, Friday, Nov. 30, 2018. Will include short ride on the trail, plus chalking "Welcome" messages to riders. It sure looks close to done! Join us on Friday, Nov. 30 as County leaders and project partners celebrate a new link in Arlington’s bike/pedestrian trail network! This project constructed a 10-foot-wide paved bicycle and pedestrian trail along the west side of Washington Boulevard. 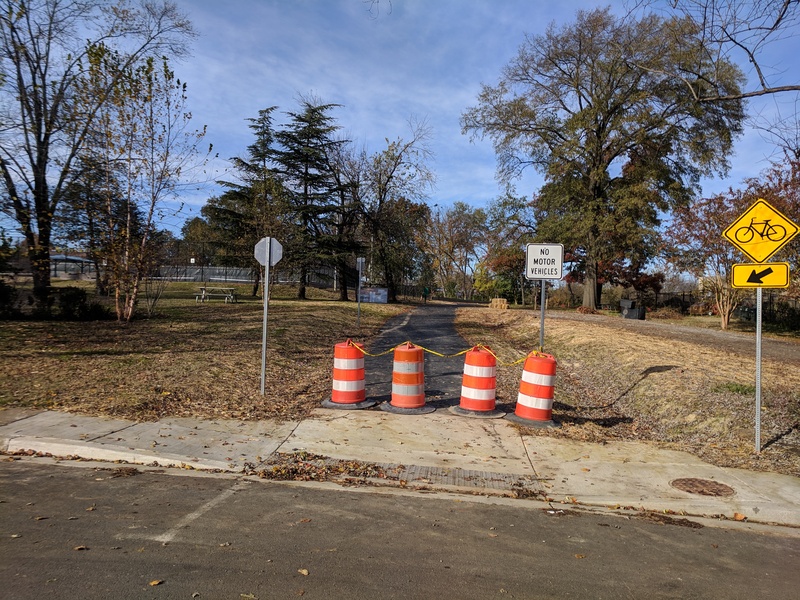 The new trail section links with the project's first phase, built between Arlington Boulevard and Walter Reed Drive, and provides a new north-south connection between the Arlington Boulevard Trail and Columbia Pike. The event will take place along the trail on the east side of Towers Park, near the corner of 9th Street South and South Rolfe Street. After remarks from our speakers, Capital Bikeshare bikes will be available for attendees to try out the new trail! I'm totally psyched for a big celebration. If anyone wants to check out the trail from afar, I uploaded some geotagged photos to mapillary. I have been trying out this trail for my commute home since last week (I got a chance to ride it in daylight over the holiday break). The new trail is great. (I am surprised that there does not seem to be any counter to show how many are using it). Only problem is the northern end has a curb cut indicating the shorter distance to continue the trail, which is good and bad - cars do not expect you there, especially since the crosswalks are elsewhere. Getting to the trail from Pentagon City is poorly signed and wow, Columbia Pike, even on sidewalks, is bad. The entrance ramp for northbound Washington Blvd (or is that west?) has no walk signal, but the exit ramp does and you need to cross the entrance ramp to get to the button. And other buttons are in bad places. This has made my trip from office to the gym be half the distance! But about 2/3 the time due to all the crossings (and one must push the button for Pershing at Jackson - bikes do not trigger the light). Going all the way home it is a little shorter in both time and distance. So I have a option if I am tired or want a longer ride (I had been doing Army-Navy Dr to 4MRT to W&OD to Custis (for home) or Bluemont (for gym)).